How do I start Bunz in my city? Starting Bunz in your city might take a little work but it will pay off! The following post includes a few tips to start a thriving Bunz community in your city. The best thing you can do to start a new Bunz community is make sure there is something new on Bunz every day. This way people will come back to see what’s been posted. People are also more likely to post themselves, following your example. On Day 1, try making 5-10 posts to populate the feed in your city. After that try posting 1-2 times a day over the course of a few weeks and you will be well on your way to a thriving Bunz community. Next you’ll want people to see the posts you’re making on Bunz. The easiest way to do this is by sharing your posts to wherever you are most active on the web. Facebook is a great place to start. Consider sharing your posts on your wall, your friends’ walls and into groups that you’re a part of. 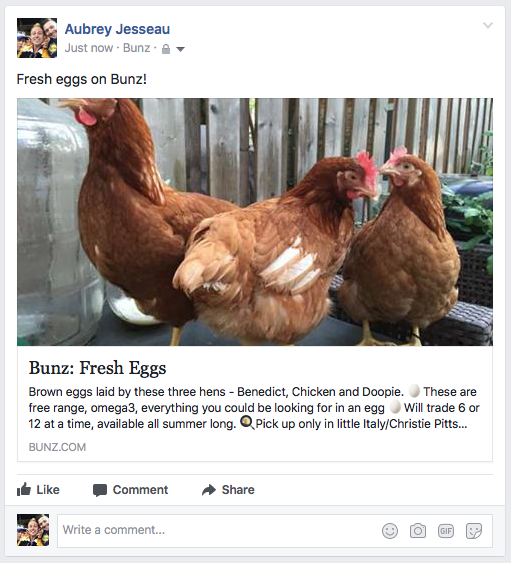 You can also share posts on Twitter and via email or text message (if you’re using the Bunz mobile apps on Android or iOS). Related: What should I post on Bunz? Related: What are safe trading zones?